Tiltfactor | Metadata Games Tag Event: May Day! May Day! 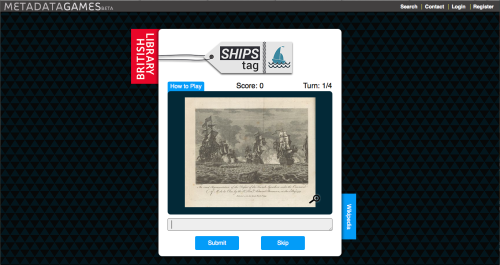 25 Apr Metadata Games Tag Event: May Day! May Day! Metadata Games (http://www.metadatagames.org) is a free and open source digital gaming platform developed by Tiltfactor Laboratories (https://tiltfactor.org) at Dartmouth College, with support from the National Endowment for the Humanities (NEH) and the American Council of Learned Societies (ACLS). The suite of games enables archivists to gather and analyze information for digital media archives in novel and exciting ways, and provides social science and information science researchers a novel tool with which to investigate crowdsourcing and human computation behaviors and outcomes. Institutions and researchers interested in the project and datasets are encouraged to contact Tiltfactor. Tiltfactor Laboratory (https://tiltfactor.org) is a design studio dedicated to understanding how games can be used to generate new knowledge. Tiltfactor designs, studies, and launches games, across a variety of platforms, that use core psychological principles and strategies to promote learning and impact players’ thoughts, feelings, and behaviors. Founded and led by Dr. Mary Flanagan, Tiltfactor uses its unique design methodology, Critical Play, to incorporate fundamental human values and psychological principles to promote pro-social values such as cooperation, perspective taking, empathy, and civic engagement.